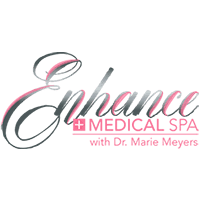 Dr. Marie Meyers at Enhance Medical Spa knows that when you look better, you feel better. To improve the health and look of your skin, she offers several treatments for skin rejuvenation at her Cincinnati medical spa including Laser Genesis, Hydrafacial, and Microneedling. To learn more about all the options, call the office or book online. What can skin rejuvenation do? It can improve both the health and appearance of your skin. Common concerns which can be addressed include fine lines and wrinkles, large pores, uneven skin tone and texture, dryness, rosacea, acne scars, and age spots. Each type of treatment offers specific benefits, but all help stimulate your body’s natural healing power to repair damaged or aged skin. Laser Genesis is a wonderful treatment used by Dr. Meyers to minimize fine lines and wrinkles, reduce scarring, shrink large pores, and even out skin tone. In addition, it is FDA-approved to diminish the redness of rosacea. The sensation is one of gentle warmth, similar to standing in front of a campfire, and patients find it very relaxing. There is no downtime, and it is one of the most popular treatments at Enhance Medical Spa because it is both comfortable and effective. Many patients do it monthly because they love the way their skin looks. The HydraFacial is another very popular treatment used by Dr. Meyers and her team at Enhance Medical Spa. It deep cleans and extracts impurities from the skin, and then infuses vital nutrients such as antioxidants, peptides, and hyaluronic acid. This is a comfortable and relaxing treatment, with no downtime. Patients notice an immediate lessening of fine lines and wrinkles, and dull skin becomes healthy and glowing once again. Many people come in monthly because the results are so amazing. Microneedling is a comfortable treatment that delivers amazing results. Tiny perforations in the skin cause the body to shift its repair mechanism into high gear, thereby producing new collagen and elastin. Patients are thrilled to see an increase in skin firmness and elasticity, with fewer wrinkles and reduce pore size. Scarring will lessen, pigmentation will decrease, and skin will continue to improve over the next several months. For any of these rejuvenation treatments, call Enhance Medical Spa today, or book online. Your skin will thank you.